Starting from Benzer's initiative, the approach of forward genetics has been widely used to isolate mutations affecting learning and memory. For this aim, mainly the odor-shock conditioning was employed. We have isolated P insertional mutations affecting memory after courtship conditioning – another form of classical conditioning in Drosophila. Here we report the behavioral characteristics of one of these mutants, which we have called nemy (no extended memory). The courtship activity of Drosophila males is reduced when a male has a previous experience of courting a fertilized female. In the wild-type strain C-S (K), this conditioned courtship inhibition lasts for 1–3 h in the test with a virgin female, and at least for 8 h in the test with a subsequent fertilized female. The mutant males nemyP153 display distinct memory deficiency in both tests already 0.5 h after training. The mutant males show an increased level of locomotor activity unrelated to courtship, and spend more time in such an element of courtship as pursuit. This, however, seems to be a pleiotropic effect of the mutation, independent from its influence on the courtship conditioning. The mutation reduces also memory performance after the odor-shock classical conditioning. At the same time, the sensory and motor functions involved in this type of learning seem to be normal. Insertion of P-lacW vector into 49B region of the second chromosome (mutation nemyP153) causes an increased level of locomotor activity, memory deficiency after the courtship conditioning and subnormal acquisition after the odor-shock conditioning. The usefulness of the model organism, Drosophila melanogaster, for studying molecular bases of learning and memory has been well demonstrated and discussed [1–7]. However, the number of mutations (< 30) known to specifically affect learning or memory is rather low assuming that there is still much to be discovered in this field. To isolate learning/memory mutants, various approaches have been used. In comparison to others, the approach of forward genetics, which is based on isolating mutants directly by the phenotype of primary interest, is characterized by the least bias when looking for previously unknown molecular components of memory mechanisms. Starting from Benzer's initiative , the forward approach had been widely used in early studies to isolate chemically-induced X-linked mutations affecting learning, such as dunce (dnc), rutabaga (rut), amnesiac (amn) and others [9–12]. Later, when the technique of insertional mutagenesis with single P elements was developed , it was applied to P insertional autosomal mutations resulting in finding of latheo, linotte, and nalyot. In all those cases, the odor-shock conditioning was used, the training procedures being based either on operant (dnc, etc.) or Pavlovian (latheo, etc.) discrimination. The courtship conditioning is another form of classical conditioning frequently used in Drosophila learning and memory studies [19–24]. After experience of courting a fertilized female, a male reduces further courtship of subsequent females for 2–3 h in case of virgins  and at least for 8 h in case of fertilized females . It has been suggested that the mechanism of this courtship inhibition is based on conditioning [25, 27–30]. A male associates presentation of the courtship-stimulating cues, typical for both virgin and fertilized females, with presentation of the courtship-inhibiting cues elicited by unreceptive fertilized females. As a result of counterconditioning of the excitatory stimuli by inhibitory ones, a female becomes less attractive to a male that reduces his courtship activity [30, 26]. Recently, we have succeeded in isolating four autosomal P insertional mutations affecting memory after courtship conditioning [31, 32]. Here we report behavioral characteristics of one of these mutants, which we have called nemy (no extended memory). The conditioned courtship is analyzed here using the two memory tests . In the retention test with an ether-immobilized virgin female, the excitatory conditioned stimuli are presented in the absence of the inhibitory unconditioned stimuli. The retraining test with a mobile fertilized female completely reproduces the situation of training. A period, when memory is yet detectable, lasts longer in the retraining test. To produce courtship inhibition in the retention test, the two things should persist in memory simultaneously. The first is association between conditioned and unconditioned stimuli. The second is a correct representation of the unconditioned stimulus itself, including its aversive properties. This nonassociative component of memory seems to decay faster than the associative one. In the retraining test, where the unconditioned stimulus is presented actually, performance depends only on associative memory . The mutant stock nemyP153 was isolated from a collection of stocks carrying a single insertion of P-lacW vector as displaying memory deficiency after courtship conditioning . To get evidence that behavioral deviations from the wild type in the mutant stock were due to insertion of P element, the genetic background in nemyP153 was replaced by 10 consecutive crosses with white (w) strain, which previously was outcrossed to C-S (K) strain. Since w mutation produces visual defect due to lack of the eye pigments , decreases mating success , impairs courtship behavior  and memory formation in the conditioned courtship suppression paradigm , the w strain itself could not serve as a control to nemyP153 after this procedure. Instead, in addition to C-S (K) strain, two P-insertional stocks from the same collection were used as a control: P11 and P21. Initially, they displayed normal learning ability. As well as nemyP153, they had colored eyes due to the presence of mini-white gene in the P-lacW vector and were subject to the same procedure of replacement of genetic background. The time course of memory performance is presented in Fig. 1 in terms of performance index (PI, see Methods) and in Fig. 2 in terms of courtship index. In the retention test with an immobilized virgin female (Fig. 1A), PI of C-S (K) males reaches nonsignificant value (i.e., a value which does not significantly differ from zero) 3 h after training. In the retraining test with a mobile fertilized female(Fig. 1B), PI stays significantly above zero for at least 6 h. These results confirm our earlier observations . Time course of memory performance in the wild-type strain C-S (K), mutant nemy (P153 stock) and two other P insertional stocks from the same collection after 30-min training with a fertilized female. A. Results of the retention test (with an ether-immobilized virgin female). B. Results of the retraining test (with a mobile fertilized female). Performance index (PI) is a measure of courtship inhibition resulted from training (see Methods). Because its calculation is based on comparison of mean courtship indices for independent samples of naive and trained males, no standard errors are presented. The markers are filled in when mean courtship index of naive males is significantly higher than mean courtship index of trained males (one-sided t test, P < 0.05). This is equivalent to testing the null-hypothesis PI = 0 against the alternative PI > 0. Sample size is about 20 naive and 20 trained males for each PI value. Time course of courtship index in naive and trained males in the retention and retraining tests after 30-min training with a fertilized female (Mean ± SE). The same data, as in Fig. 1. Courtship index is a percentage of time spent in courtship. Usually, fertilized females elicit less male courtship than the virgins do [36, 25, 28]. In contrast to these data and our previous study, where the same C-S (K) strain and exactly the same two tests have been used , here the situation is reversed (Fig. 2). Such a change with time may be explained by some microevolutionary events in the population, primarily as the genetic drift. No wonder that nemyP153 and the control P insertional stocks display the same peculiarity (Fig. 2) because their genetic background derives from the C-S (K) strain. Stimulation of courtship is a multimodal process [19, 21]. A situation, when the mobile fertilized female makes a greater appeal to a male than the immobilized virgin female, suggests a higher significance of visual stimuli (female's movements) in courtship stimulation. In the wild type, memory performance in both tests decays with time mainly due to a rise of the courtship activity of trained males, while in naive males it stays relatively stable (Fig. 2). Fluctuations of courtship index in naive males reflect the fact that each time point is presented by its own sample of naive males tested in parallel with an independent sample of trained individuals. Sometimes, these fluctuations are highly expressed, as in nemyP153. As our experience shows, the level of courtship may vary from day to day, being dependent on some uncontrollable factors, such as weather. In an experiment including multiple lines of comparison, one should choose the priority for comparisons to be made with higher precision. In our experiments with four fixed factors (training, test, time after training, genotype), the highest priority was given to the comparison of naive and trained males within each combination of other variables, the next to the type of test, and the next to the two other factors. In each experiment, an equal number of naive and trained males within a combination was tested in parallel. Due to this blocking, the performance index (Fig. 1) suffers less from variation of uncontrollable factors than the courtship index. A greater variability (with time after training) of the courtship index in naive nemyP153 males, in comparison to other genotypes, may reflect their greater susceptibility to the influence of some uncontrollable factor (Fig. 2). The negative wave of performance index with a peak at 0.5 h after training, common for all genotypes (Fig. 1), is not surprising because memory processes are often manifested in a wave form. Earlier we have observed the same negative wave in the C-S (K) males (in the retention test only), but with a peak at 15 min after training . In mammals, a transient deterioration of memory performance soon after training is known as a Kamin effect  and presumably results from the retrieval failure . 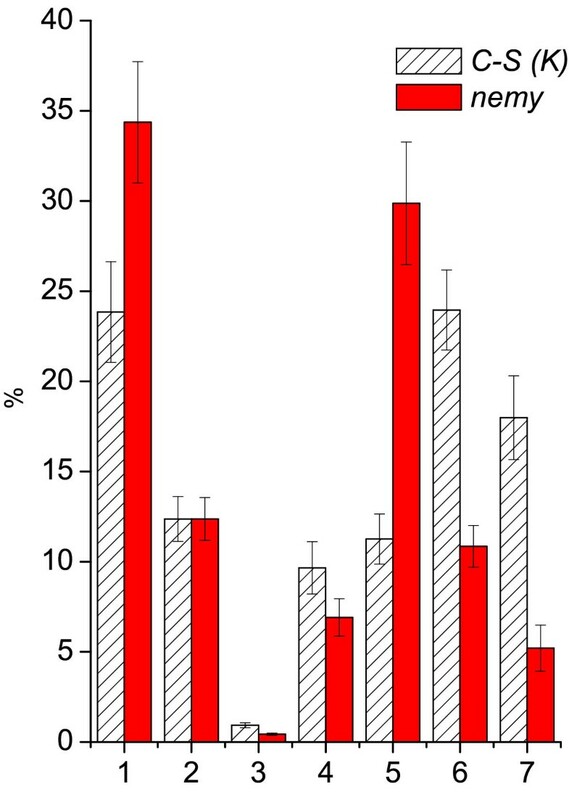 In males of the control P-insertional stocks, P11 and P21, the time course of memory performance in the retraining test is very similar with that of the wild-type males (Fig. 1B). In contrast, nemyP153 males display nonsignificant PI beginning from 0.5 h after training, clearly demonstrating the mutant behavioral phenotype. In the retention test, the mutant phenotype of nemyP153 males is also evident if to compare them with the wild-type C-S (K) males (Fig. 1A). The control P-insertional stocks differ by their behavior in this test. Memory retention is longer than in the wild type in P11 males and shorter in P21 males, indicating that P11 and P21 insertions possibly affect some functions specifically important for memory performance in the test with a virgin female. The main difference between the retraining and retention tests is the absence of unconditioned stimulus in the second one. When a conditioned stimulus is presented alone (after successful conditioning), it first retrieves a representation of unconditioned stimulus from some long-term store into a limited-capacity rehearsal mechanism [39, 40]. The retrieved representation controls the conditioned response. It may contain incomplete information being essentially different from the representation that originates from actual presentation of the unconditioned stimulus . Consequently, performance in the retention test depends on memory of the unconditioned stimulus (a kind of nonassociative memory), while performance in the retraining test does not. This explains why 3 h after courtship conditioning and later, memory performance is better in the retraining test than in the retention one . This may also explain, why P11 and P21 males behave similarly in the retraining test and differently in the retention test, if to suppose that these P insertions affect ability to form, store or retrieve correct internal representation of the unconditioned stimulus. Thus, it is principally important that nemyP153 males show mutant behavioral phenotype in both tests assuming that the mutation affects rather the associative than nonassociative component of memory after courtship conditioning (for discussion of possible associative and nonassociative memory components in courtship conditioning see ). The difference between the retraining and retention tests may be much deeper than discussed above. They may differentially reveal memories originating from distinct learning processes. Together with nemyP153, we have isolated and studied three P insertional autosomal mutants which behave differently in the two tests immediately after training [31, 32]. We have suggested that two distinct learning processes contribute to memory performance, and they are selectively affected in these mutants . The first is a counterconditioning of the excitatory courtship-stimulating cues by inhibitory ones that lowers the appetitiveness of a female [30, 26]. The results of the counterconditioning may be revealed as male courtship inhibition in the course of training with a fertilized female and both in the retraining and retention tests. The second is a simple Pavlovian classical conditioning, when the conditioned stimulus acquires ability to produce response normally elicited by the unconditioned stimulus, i.e., an ability to block further courtship. When only the time spent in courtship is registered (instead of individual responses to each presentation of conditioned stimulus), the results of this learning cannot be seen in the course of training or in the retraining test. Here, courtship is blocked by direct presentation of the unconditioned stimulus from a mobile fertilized female both to the trained and naive males. Normal (or near-normal) memory performance in both tests immediately after training in nemyP153 (Fig. 1), as well as in such mutants as dnc, rut and amn, means that no specific impairment of the mechanism of counterconditioning or the mechanism of simple classical conditioning takes place here. All these mutants differ from the wild type only by the onset of memory deficiency showing that the general ability to form or to process in either way an association between conditioned and unconditioned stimuli seems to be deficient. Some deviations of the courtship ritual or general behavior may influence memory performance in the mutant males. Indeed, the time spent in locomotion is significantly higher in nemyP153 males than in the wild type (Fig. 3). Accordingly, they spent less time in preening and rest. This evident hyperactivity also reflects in usage of the courtship elements: mutant males spend more time in pursuit and orientation (probably, only in the pursuit because we did not register these two courtship elements separately). One may suppose that the locomotor hyperactivity makes it difficult for a male to suppress the courtship elements related to locomotion, i.e., pursuit, thus resulting in a poor performance of courtship conditioning in the retraining test (Fig. 1B). But a poor performance in nemyP153 is also observed in the test with an immobilized virgin female (Fig. 1A) where a male uses no pursuit during courtship. One may further suppose that an increased level of locomotion may negatively influence performance in both tests by some other mechanism. But this does not explain delayed appearance of the mutant phenotype in nemyP153 with time after training (Fig. 1A). Thus, it seems likely that memory performance deficiency in nemyP153 males is not a consequence of their hyperactivity. Rather both hyperactivity and memory deficiency result from some general cause created by the mutation. The two behavioral effects of the mutation may arise, for example, from malfunction of some inhibitory system involved in both regulation of locomotion and conditioned inhibition of courtship. Percentage of time spent in various elements of courtship and general behavior by the wild-type and nemyP153 males (Mean ± SE). Naive males were observed in a pair with a fertilized C-S (K) female for 5 min. N = 40 in each sample. X-axis: (1) pursuit and orientation; (2) wing vibration; (3) licking; (4) attempted copulation; (5) locomotion unrelated to courtship; (6) preening; (7) rest. Another form of learning has been examined to make clear whether memory deficiency in nemyP153 is general or is only specific for the courtship conditioning. In the odor-shock paradigm of classical conditioning, nemyP153 demonstrates subnormal level of memory performance as compared to the wild-type strain C-S (K) (Fig. 4A). After exposure to the electroshock, the mutant flies show normal avoidance of 3-octanol and 4-methylcyclohexanol, the odors used as conditioned stimuli (Fig. 4B). No significant difference is observed between the mutant and wild-type flies in their ability to escape electroshock (Fig. 4C, two-sided t test, t = 1.58, P > 0.05). Thus, both sensory and motor functions involved in the odor-shock conditioning seem to be normal in nemyP153 flies. Behavior of the wild-type strain C-S (K) and nemyP153 mutant in the odor-shock paradigm of classical conditioning. A. Time course of memory performance. B. Avoidance of 3-octanol and 4-methylcyclohexanol. C. Reactivity to electroshock. Means and standard errors are shown. Sample size (the number of experiments) is shown in parentheses. The fact that nemyP153 mutant reveals a subnormal PI immediately after the odor-shock conditioning (Fig. 4A) assumes that the phase of acquisition may be affected by the mutation. On the other hand, in the immediate retention tests after courtship conditioning, the mutant does not differ from the wild type (Fig. 1A), assuming that acquisition is normal, and the mutation affects the memory phase. So, this point remains unclear. There is a parallel with these effects of nemyP153 mutation. Mushroom bodies ablation impairs acquisition in the odor-shock paradigm  and memory retention (but not the acquisition) in the courtship conditioning paradigm (in the test with a virgin female) . Interestingly, prior to the backcrossing to w strain, nemyP153 males displayed memory failure later than in this study . PI stayed significantly above zero till 0.5 h in the retention test and till 3 h in the retraining one. That is why we have called the mutant no extended memory (nemy). P insertion in nemyP153 strain was localized cytologically in the second chromosome at 49B region. The cloning of a fragment of genomic DNA flanking the P insertion (K. Iliadi, to be published with other molecular-genetic data) and its comparison with the fruit fly DNA database (Berkeley Drosophila Genome Project) showed that the nemyP153 insertion is located in the intergene space after the fifth exon of the gene CG8772 and before the first exon of the gene CG8776. It seems likely that mutation nemyP153 produces its behavioral effects by altering the properties of an enhancer regulating transcription of the nearby genes. Genome annotation database of Drosophila (GadFly) reports that the gene CG8776 has 3 transcripts . It presumably encodes a carbon monoxide oxygenase (cytochrome b561) which is a component of the transport vesicle . Gene CG8772 encodes a product, which shows high homology with mammalian glutaminase (EC 3.5.1.2) . The role of glutamate (the product of glutaminase) as a transmitter in the insect neuromuscular junction is well known, and the mechanisms of glutamate synaptic plasticity are described for Drosophila neuromuscular junction . Glutamate-like immunoreactivity is found in Kenyon cells of the mushroom bodies [47, 48], the centers of the olfactory associative learning . If also to take into account a bulk of evidence concerning the role of glutamatergic transmission in learning, memory and synaptic plasticity in mammals, the function of the glutaminase gene seems to be quite feasible as a target affected by nemyP153 mutation. The outbred wild-type strain C-S (K) is a Canton-S strain maintained in mass for several decades in Pavlov Institute of Physiology in Koltushi (St. Petersburg). It served as a control in most of the experiments. P insertional stocks P11, P21 and P153 (nemyP153) were generated earlier  by transposition of the nonautonomous P-lacW vector from the X-chromosome into one of the autosomes using Δ2–3 nontransposable P element as a source of transposase . The technique of mutagenesis based on the single P element transposition strategy  and the stocks used were essentially the same as in . P-lacW vector contained the bacterial reporter gene lacZ, mini-white sequence and the ampicillin-resistance gene amp R . The outbred strain w carrying homozygous white1 allele was outcrossed to C-S (K) strain for 5 generations and then used for replacing the genetic background in the P insertional stocks by 10 consecutive crosses. where CIna and CItr are the mean courtship indices for independent samples of naive and trained males, respectively. PI of 100% corresponds to complete courtship inhibition after training, while zero PI to no inhibition. All other details of the technique are described in . The programs used for behavior registration and primary treatment of the data were written by N. Kamyshev. Classical conditioning to odors (4-methylcyclohexanol and 3-octanol) with negative reinforcement by electroshock was performed according to Tully and Quinn  in modification of Preat . Presentation of one of the odors to a group of flies (50–100 individuals) was paired with electroshock, presentation of the other was not. For memory testing, trained flies were transported to the choice point of a T-maze and allowed to choose between the two odors. PI was calculated as the difference between percentage of flies making the correct choice (unreinforced odor) and percentage of flies making the incorrect choice. A score of 0 corresponds to random distribution, PI of 100% corresponds to completely right choice. To test the sensory and motor components involved in the odor-shock conditioning, the odor avoidance and shock reactivity were examined. Earlier it was found that exposure to electroshock may change the odor avoidance . That is why the procedure described in , most close to a real conditioning experiment, was used as a control for possible changes in nonassociative components of the odor-shock conditioning. Briefly, to test, for example, avoidance of 3-octanol, the flies were first exposed to 4-methylcyclohexanol paired with the electroshock, and then were allowed to choose between 3-octanol and pure air in the T-maze. To test shock reactivity, the flies were allowed to choose between two electrified arms of a T-maze, one of which was connected to the current source. Odor avoidance and shock reactivity were calculated as the difference between percentage of flies avoiding the odor (or shock) and percentage of flies making the opposite choice. A score of 0 corresponds to random distribution, 100% corresponds to complete avoidance of the odor (or shock). All statistical comparisons were made using the t test at significance level α = 0.05. One-sided criterion was used to test the null-hypothesis CIna = CItr against the alternative CItr < CIna. This is equivalent to testing the null-hypothesis PI = 0 against the alternative PI > 0 (negative PI appears to have no rational interpretation in terms of learning). In all other cases the two-sided criterion was applied. That was carried out according to  using P-lacW vector as a probe. The work was supported by grants 02-04-48502, 99-04-49486 and 96-04-00099G from Russian Foundation for Basic Researches to N. G. Kamyshev, contract 43.073.1.1.2507 with Ministry of Industry and Science of Russian Federation and grant 98-2-108 from Russian Federal Subprogram "Paramount Directions in Genetics" to N. G. Kamyshev and E. V. Savvateeva-Popova, C.N.R.S. stipend to E. V. Tokmatcheva, and short-term visit (N.G. Kamyshev) exchange convention between C.N.R.S. and RAS. The authors are grateful to Prof. Martin Heisenberg for support and critical reading of the manuscript. The authors are also grateful to the three anonymous referees for their comments. Many thanks to our American friends (Karen Suta, Katya Zalenskaya, Glenn and Veronica Radice) for final polishing of the text. Kamyshev N. G. developed the study, performed the statistical analysis and wrote the manuscript. Iliadi K. G. generated a collection of P insertional mutants and isolated nemyP153. Bragina J. V. carried out experiments on conditioned courtship. Kamysheva E. A. tested the shock reactivity. Tokmatcheva E. V. tested the odor avoidance and participated in cytological localization of P element in the nemyP153 stock. Preat T. tested memory after the odor-shock conditioning. 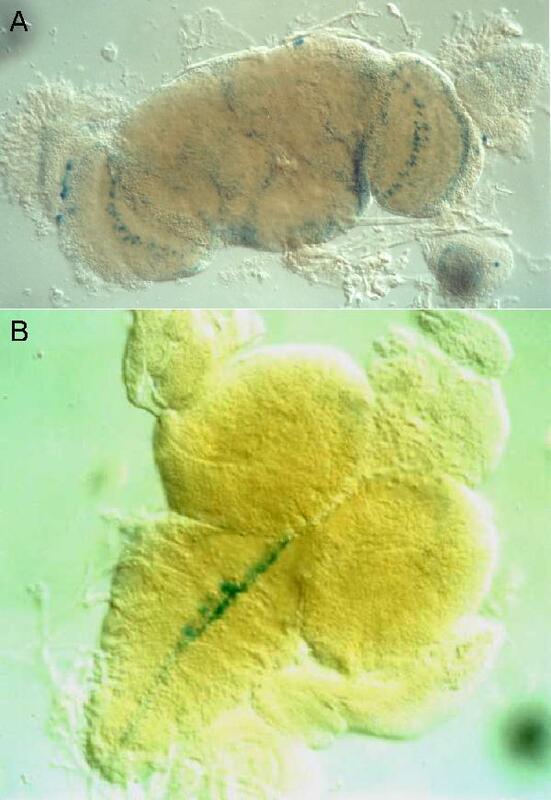 Savvateeva-Popova E. V. participated in cytological localization of the P element and in preparation of the manuscript.